Alligators, witches and a spooky mansion aren’t your average neighbors . . . not unless you live at the edge of the Ornofree swamp in the backwater town of Hadleyville. Pete Riley may only be eleven, but he’s already up to his eyeballs in big trouble, and this time the town’s bad boy, Pete, didn’t cause it. This time the trouble arrived when a legendary hundred-year-old mansion materialized next door with someone inside, someone who came to seek him out. 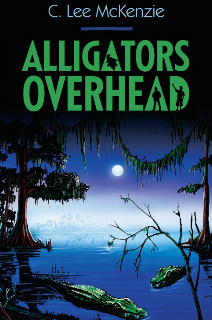 Then the Ornofree alligators declare war to try to save their swamp from being bulldozed for a shopping mall, and Pete discovers he’s living among a coven of “sadly-out-of practice” witches. When one of their ancient “magick” spells goes wrong and all the witches vanish, including his guardian aunt, Pete’s left to face the perils of the Ornofree Swamp War alone. He soon discovers that he just might have inherited the family talent for witchcraft, and, although he doesn’t know one thing about the practice of spell casting, he’s the only one left in Hadleyville to do it. It’s up to him work some dangerous “magick,” restore his aunt and bring back all the other witches. He might stand a chance of succeeding if his one friend, Weasel, sticks with him, but even the two of them may not succeed. Available from Amazon and Barnes&Noble. When I do my final revisions, I jump between rewriting the first pages to rewriting further into the story, tweaking both until I get that engine firing on all cylinders starting from page one. What I’ve found is that a smoothly running plot is really all about bringing those characters to life before I do anything else. To me the characters are where the real ACTION is. So how do you do that? How do you take the idea of a person and using only words make them “real”? Here are two techniques I like. Use HYPERBOLE. I love to exaggerate when I’m writing for kids, but I think it works for adult stories as well. Here’s what I mean. Sure Max might be big, but I wanted him to appear super big to the kids at school. The description is funny because it’s absurd. Also it gives an idea to the reader that maybe this Max scares those kids, especially Josh, so there’s a bit of plot hinted in this short characterization. I’m getting to the ACTION through the character. Here’s an example from adult fiction. I loved this because I can’t count how often I’ve waited for someone who is never on time, all the while wishing I had a way to express my frustration without making a huge fuss. Brown does that. I can see the friends in this scene, one tapping her foot, the other having just strolled up late again. Make them ECCENTRIC. Readers need to connect with characters, but they really remember those with that touch of weirdness to them. For me, Captain Ahab comes to mind almost immediately. How about Holden Caulfield or coming forward in time, the Dursleys. They somehow stick in my mind because they were supposed to be ordinary in this extraordinary story, and they had all kind of quirks. I think the character of Theresa in Al Capone Does My Shirts was a great quirky character. Here she’s showing Moose around his new home on Alcataraz. “First, we’re going to the morgue,” Theresa announces with a little skip. This is only a small touch of the eccentric, but small touches work. There’s so many ways to characterize and stir up the ACTION at the same time. These are only two techniques. What are some you use? What are some you don’t think work? offers some insights into the growing problem. grade novel about magick and some uniquely talented alligators. C. Lee can be found at her website, blog, on Twitter or Facebook. Find her other books at her Author Page on Amazon or Goodreads. Picked up my copy today – I know Might Mite's going to want to read this one! Great post, great tips for children's writing. Hyperbole definitely works and reflects every child's active imagination and speech. @Susan Thanks for the support. You're always there for writers! @Madeleine Great to see you here. I love those laugh out loud reactions to exaggeration. I'd lie to you for your love…and that's the truth. You are too much, Buddy! Love your comments more than a dozen hot fudge sundaes! As to energy, if you have some to spare send it over! Wow! These are awesome examples of how to add character to your characters–LOL! 😀 I tend to start the same way myself with the characters first, story second. Like I'll get some really interesting person in my head, and then I'm like, "Whatcha gonna do?" And much like you, my beginnings are always the weak link. Your book sounds so fun. I have to share it with my daughters. Thanks, Lee & Susan! Ah, yes. THose beginnings. First it's the characters that wake us up, and then it's rewriting the beginnings that keep us awake. I didn't know writers get so little sleep. Hope your daughters enjoy the swamp romp! Let me know. This book trailer is very awesome. Certainly did a great job of capturing my attention and not letting go. C. Lee, I love this post. You have such great examples that I'll have to keep in mind when doing my own work. Thank you and thanks, Susan, for having her here today. How sweet of you to pop in and leave such a great comment for us. Really appreciate it a lot! Loved the examples you shared. I like hyperbole, I think it works well, as do small eccentricities, like the one you shared from Al Capone Does My Shirts. But I do hate it when an author goes overboard with the eccentricities. Then it just feels contrived. Agreed. It's that balance that's so tricky. Some writers get it just right and then it's amazing. Great tips on character development. It's something I struggle with. Thanks for the tips. You don't need these tips, Natalie! I know you already have them nailed down, but thanks for the comment. I love it. I love the trailer, Lee! Spooky and intriguing!! So great to see you Kelly. I'm laughing and almost hearing your hyperbole as I read your comment! Another entertaining stop on your Swamp Hop! Susan, Thanks for hosting Lee! We must have the same itinerary this week!